Advent and Noah and Jesus Entry Into Jerusalem | "Northern Crossings"
end time. (1 Thess. 5: 1 ) Be ready. A. Prepared -not with physical safe-guards, guards, burglar alarms; nor with delusions that if we do our best that we will make out all right. B. Prepared -with the preparation only God can provide: total trust in His message; total faith in His Son and way of salvation; total reliance on His grace -all that the Spirit Himself gives us. C. Prepared -to live the new life His coming brings. 1. 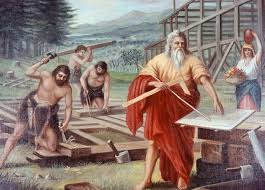 Noah built his ark and “by this he condemned the world and be-came an heir of the righteousness that comes by faith” (Heb. 11: 7) . The rain was a relief -after all the ridicule, the testing of his faith, to know for sure that the forbearing God was washing out the old to begin a new earth (1 Pet.3:20). And when “Noah went forth” he “built an altar to the Lord” (Gen. 8: 18-20) and lived the new life on the new world. 2. Many were ready to accept His entry into Jerusalem as the beginning of blessing for all-“Hosanna to the Son of David! Blessed be He who comes in the name of the Lord.” (Matt. 21: 9) 3. For “those who love His appearing” (2 Tim. 4: 8) the faith that Jesus “makes all things new” (Rev. 21: 5) makes each day new.